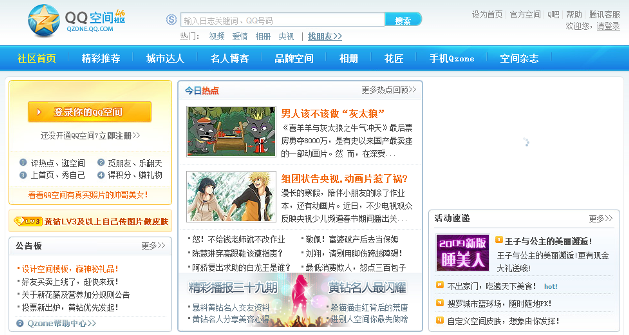 China's Social Network QZone Is Big, But Is It Really The Biggest? Tencent, China’s largest Internet portal mostly known to us for its hugely popular instant messenger product QQ, published an updated report on the user numbers of its social networking service QZone last week. The report was only available in Chinese, but the folks over at Web2Asia were kind enough to translate it. And if the self-reported numbers are not too much of an exaggeration, they’re nothing short of mind-blowing. Even taken with a healthy grain of salt, the stats Tencent are presenting deserve a mention: the report claims more than 200 million people were using QZone as of January 31, 2009, surpassing international players like Facebook (which recently announced 175 million registered users) and MySpace. 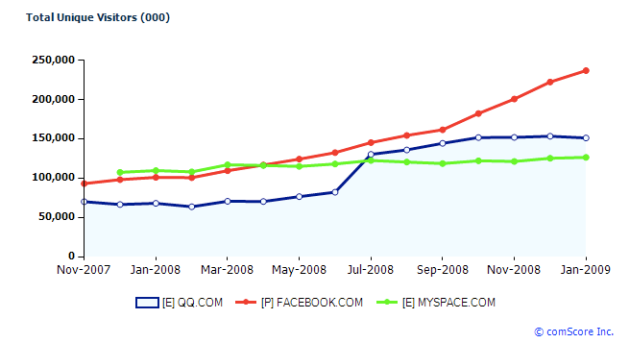 For the sake of comparison, we took a look at the worldwide comScore stats for the aforementioned social networking services, but they only give you an overview of visitor numbers for QQ .com instead of QZone separately (which has its own subdomain). To be frank, we don’t even know if the comparison flies because we’re not sure where QQ the communication (IM) service ends and where QZone the social network begins. Going back to Tencent’s report, it states that about 150 million out of the total 200 million are actively contributing on Qzone by posting blogs, sharing photos, and interacting with other users. In Qzone, about 4 million users are supposedly uploading an average of 60 million photos every day. Furthermore, on February 9 the company’s instant messenger QQ reportedly recorded more than 50 million concurrent users. The numbers are so impressive that we dug a little deeper, stumbling upon a report on DataCenterKnowledge which also wonders if QZone is bigger than Facebook globally or not. The article points to Netcraft’s latest monthly web server survey, which this month started including the Qzone blogging service. Netcraft: “this month’s inclusion instantly makes the company the largest blog site provider in the survey, surpassing the likes of Windows Live Spaces, Blogger and MySpace.” Facebook is under-reported here because Netcraft’s survey doesn’t capture all the activity at social networks and instead zooms in on sites rather than users. Furthermore, QQ has more social networking services targeting various markets besides QZone. QQ Xiaoyou, a service targeting students in universities and high schools, has over 20 million registered users and it only officially launched in January, 2009 (it’s been in private test mode since June 2008). If QQ doesn’t operate the world’s largest social networking sites already, it will soon.